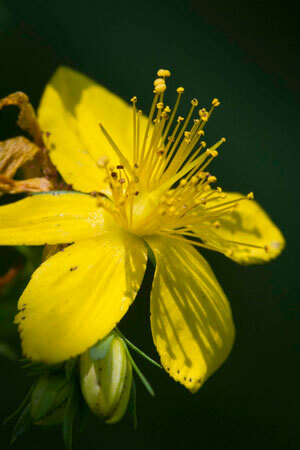 St. John's Wort (SJW) received its names because it blooms around around the summer soulstice which falls on St. John the Baptists' birthday. In herbal medicine the SJW is used as a nervine and sedative to treat a variety of conditions associated with the nervous system. It has been used as an antidepressant to relieve melancholy and improve moods. Research supports the use of SJW for mild, moderate and possibly even severe depression. The main active ingredient, hyperforin, has many effects on the nervous system including inhibiting the reuptake of several neutransmitters associated with mood (e.g. serotonin, dopamine and GABA). Historically it was also used internally and externally for nerve pain (e.g. neuropathy, sciatica, etc) but this indication has not been researched. Clinical trials have shown promise for some female complaints including premenstrual sydrome (PMS) and menopausal hot flashes. SJW is a useful antiinflammatory and vulnerary herb in the topical treatment of superficial wounds (e.g. surgical wounds and burns) but also for eczema and psoriasis. Caution: it acts as a photosensitizer and can increase the risk of sunburn.